Not only do they have now the tallest building in the world (see my previous blogs about Burj Dubai here) and one of the most ambitiously growing skylines, but they're planning this amazing architectural landmark. This building will truly advance architecture into a new realm. The planned 80-story building will have independent units on each floor that will constantly rotate. 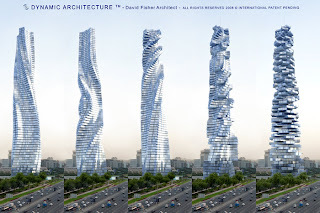 Each floor will rotate at varying speeds creating a constantly changing "dynamic" structure. Isn't this the coolest most beautiful concept. What is even more revolutionary about this building is the way it will be constructed. Each unit will be constructed at a pre-fab factory which will reduce the amount of people needed to build this massive structure. Each unit will then be hoisted up to its proper floor, starting at the top and working down. So essentially it be a core tube in the center with detached individual units. 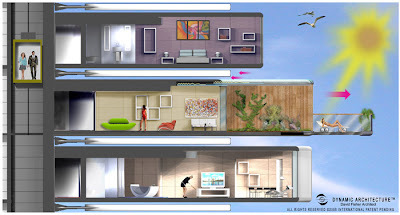 You'll be able to drive your car into the elevator, ride up to your home, park your car at your front door (let's say you have the penthouse on the 80th floor). The Dynamic Tower will be the first 100% self-powered Green building with the ability to generate electricity for itself through the use of horizontal wind turbines and solar panels. "Luxury penthouse villas, at over 1,000 square meters (11,000 square feet), are completely custom-made to fulfill individual buyer's personal needs and wants and include all selected finishes from floor to ceiling, including bathrooms, kitchens, lighting and even furniture. 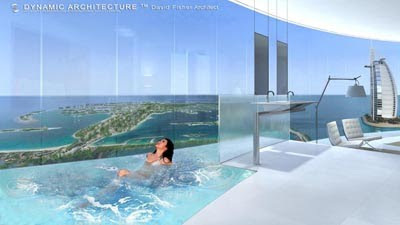 The luxury Italian marble bathrooms are pre-assembled at the Leonardo da Vinci factory in Italy, part of the Dynamic Group, and include a sauna, Turkish bath, and are further enhanced by the pleasures of color and sound therapy. Equipped with the latest in Smart Home technologies for seamless living, all Dynamic Villa residents have voice- and touch-activated control of their Villa's rotation speed and direction, plus control of entry, security, surveillance, climate, lighting, multi-media home entertainment, and even the temperature of their indoor swimming pool. Villa residents are also able to drive immediately into a special elevator that safely transports their car to their floor to park directly at the entrance to their Villas, providing the luxury of convenience coupled with the necessity of security. Presenting every resident with the brilliance of constantly changing views, effortless living powered by sophisticated electronic devices, and the extravagance of high-quality design details each Dynamic Tower throughout the world will be unique, becoming an iconic structure wherever it's built. Collectively, the Dynamic Towers will represent an era of a new architecture that will change the look of our cities and herald a new era of Dynamic Living. " 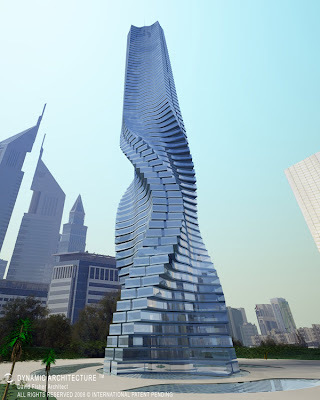 Another similar building, although not as tall :(, is planned for Moscow.